It would be nice to have a control that allows basic drawing functionality on the PictureEdit. Basically, a color picker, lines with optional arrow ends, drawing with mouse cursor, basic shapes like square and circle and maybe a highlighter. I can see the usefulness of such a control. Users could load an image into the PictureEdit control and draw some shapes or lines onto the image for whatever reason. My idea was to create a PictureEdit descendant control which could be dragged onto a form at design time and which internally handled drawing those shapes onto itself at runtime. The developer shouldn’t have to do any customization–it should just work. Here is where your end user will pick which tool they want to use on the PictureEdit canvas. 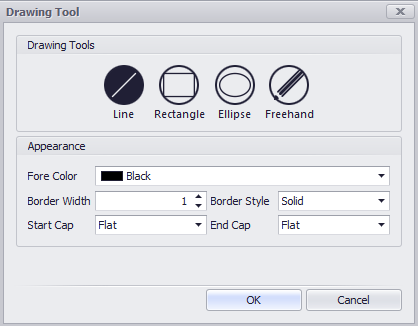 Different tools have slightly different options (start & end caps only apply to lines, and only the rectangle and ellipse can be filled). 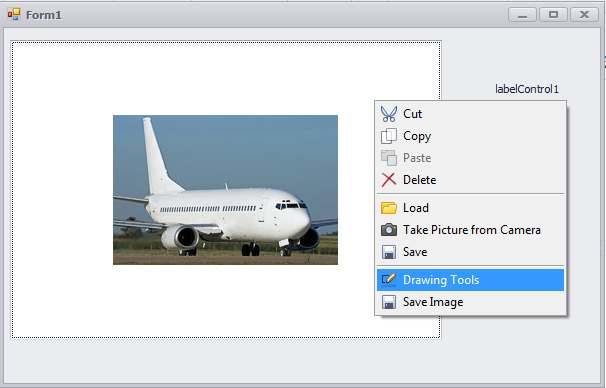 Once the user clicks OK, the PictureEdit turns into “Drawing Mode” where it tracks the mouse buttons and movement and paints the shape/drawing onto the canvas. This is really a quick overview of how it works, but the internals of the whole project are just basic GDI drawing commands which can be studied anywhere. Some important points to note are that the control should force itself to redraw when the mouse is moved (and the user is actually drawing something) via the Invalidate method. We also want to take care to dispose of GDI objects wherever possible, because Paint events can be fired very often which increases the result of a memory leak or an exception as GDI handles increase. PS. Forgive the code formatting in this post–WordPress doesn’t seem to be very friendly to formatted C# code anymore.